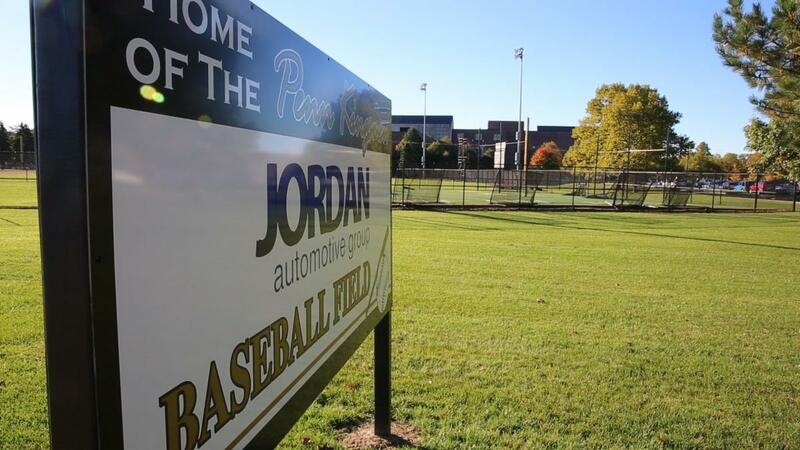 The Jordan Automotive Group Baseball Field, located just north of the main Penn High School building off of Bittersweet Rd., has a seating capacity of more than 1,200. Bleachers are constructed behind both the home-team dugout and the visiting-team dugout. There is also lawn seating inside the complex. Additional seating can be brought in for special tournament events. The field has a clay and grass surface that was installed in 2006. The dimensions of the field are: 315 feet to the left-field foul pole. 380 feet to the center-field fence, and 315 feet to the right-field foul pole. The backstop area is 40 feet. There are enclosed concrete dugouts on the first-base and third-base sides, as well as batting cages. Jordan Automotive Group Field has lighting for night games, and has hosted IHSAA sectional and regional events. The permanent press-box structure also houses a concession stand and restroom facilities. There is also a baseball junior varsity/freshman baseball field located east of the softball complex off of U.S. 20.